FOR IMMEDIATE RELEASE: Portland, Maine (February 5, 2018) – New England Fights (NEF) returns to Aura in Portland on April 14, 2018 with the fight promotion’s next mixed-martial-arts event, “NEF 33: Riptide.” Earlier today, NEF announced the addition of a professional lightweight bout to the card. John Ortolani (8-11) will meet Caleb Hall (0-0) at a fight weight of 155-pounds. John Ortolani, a native New Englander now residing in Florida, is one of the most popular athletes to ever step into the NEF cage. Ortolani has made his mark both in MMA and on the lacrosse field where he has played for several teams in the Major League Lacrosse circuit over the years. Having competed regionally in MMA since 2009, Ortolani made his NEF debut in the fall of 2012 with a submission win over Bruce Boyington (14-11). The upcoming fight with Hall will be Ortolani’s fifth trip to the NEF cage, not counting one further appearance in the NEF boxing ring. He currently trains with Robson Moura Nations United (RMNU) in Tampa, Florida. Caleb Hall has had a prolific amateur MMA career with an impressive record of 8-3. 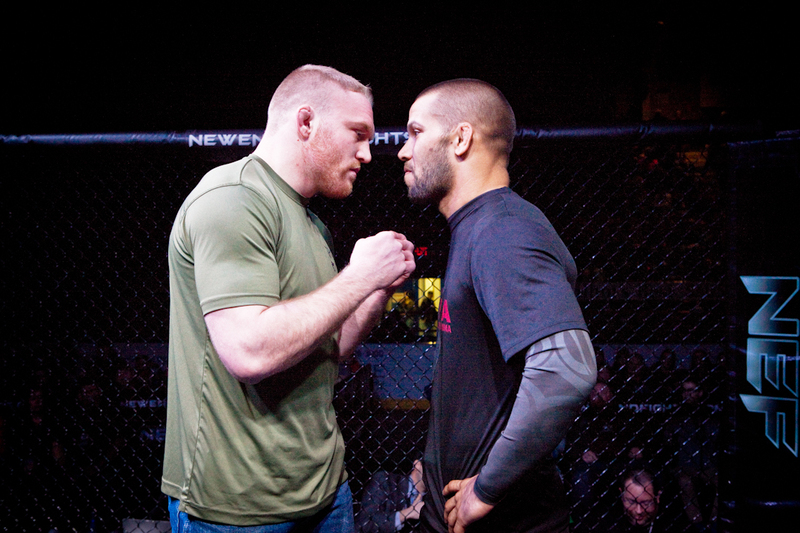 Prior to entering the MMA ranks, he was a two-time Maine state champion wrestling for Dirigo High School in Dixfield. Hall later wrestled for both Plymouth State University (PSU) in New Hampshire and the University of Southern Maine (USM). He captured the NEF Amateur Featherweight Title in the spring of 2016 with a submission of Erik Nelson (2-3). He later successfully defended that title against Johnny Crafts (4-1) at “NEF 25” in the fall of that year. Hall is a member of the Choi Institute in Portland, Maine.